【FAN with POWER BANK】Portable handheld fan. The handle part of the fan is detachable which can be separated from the main body. It works as a rechargable power bank. Just charge your mobile devices with this fan. What a really portable and human-friendly design it is! 【PORTABLE & DURABLE】Come with a rechargeable bulit-in Li-ion battery, can be charged by USB charger, computer, powerbank, etc. 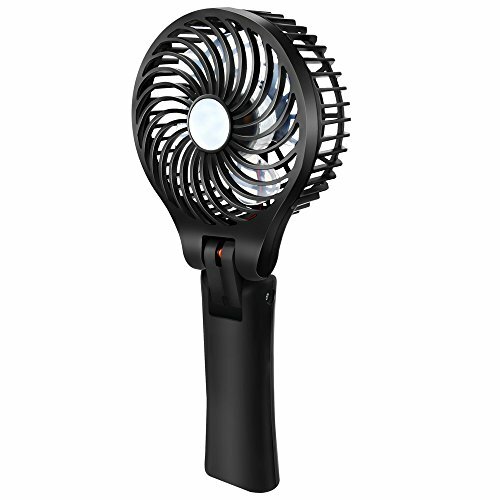 【ADJUSTABLE SPEED】Muti-speed adjustable(Low-Medium-High)fan, free to turn down or turn up air volume by press power button repeatedly. 【EFFICIENT POWER】Minimize the loss to save energy and protect environment. Great travel fans for cooling or beauty in hot weather. 【FOLDABLE DESIGN】Creative foldbale design make it as desktop air fan or handheld fan. With a hanger and a mental clip, it can be attached to umbrella, baby carriage, desktop, tent, etc.